If you want to give your bedroom a new look but can’t afford to redecorate, there are some simple ways to jazz up the space. Check out these nifty ideas for some purse-friendly inspiration. 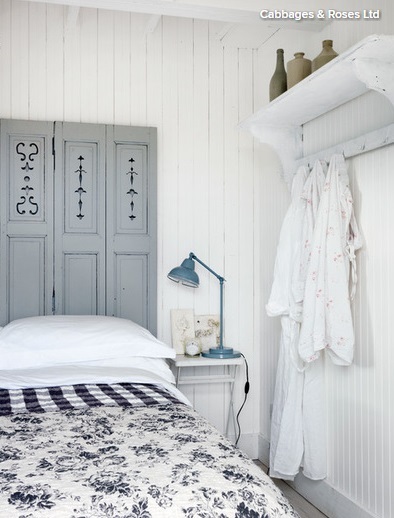 A quirky alternative to a gallery wall above your bed is a row of hooks. Here, a panel of hooks stretches across the whole wall and provides the perfect place to hang pictures and pretty bags. 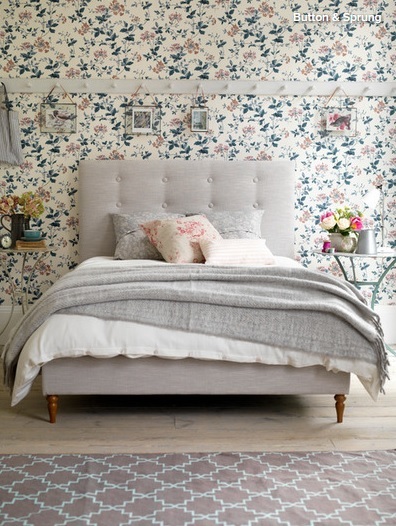 One of the easiest ways to change the look of your bedroom is with textiles. 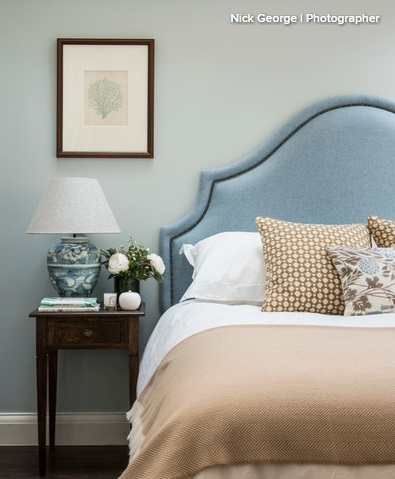 Look out for attractive throws, blankets and cushions, and dress your bed for an instant revamp. 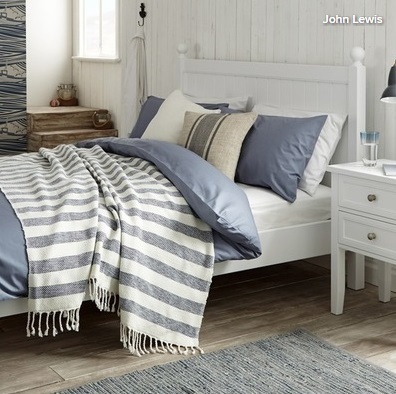 This plain, neutral bedroom has been given a laid-back coastal look with a striped throw and cushion. Simple as that! 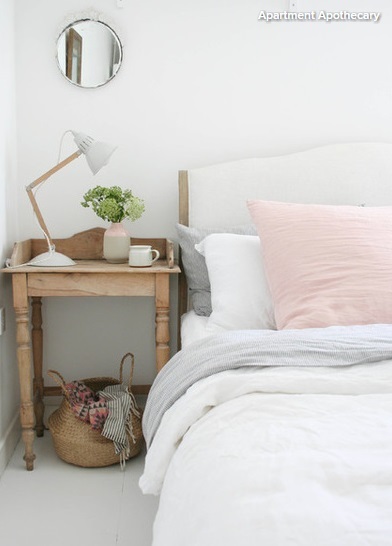 Instantly revitalise your bedside table by giving it a spring clean. Clear away any clutter on the surface and replace it with a few essentials, such as a lamp and a book. To spice up the look, add some flowers or an unlit candle and highlight the space by positioning a piece of art directly above it, as seen here. Add storage to the area around your bed with a couple of well placed wardrobes. These Ikea cupboards have been perfectly positioned to create a cosy area for the bed in between. Paint the sides of the cupboards and the wall behind in a shade that contrasts with the rest of the room and fit some handy shelves into the new space. If your bedroom is small or your budget doesn’t stretch to a new bedside table, consider installing a shelf instead. This wooden one fits neatly into the corner and leaves space beneath for extra storage. Budget buys don’t have to be boring. Think creatively and you can dream up ways to easily pep up your furniture. These inexpensive, glass-topped Ikea tables were revamped with a few coats of dark varnish and a sheet of white vinyl attached to the underside of the glass. 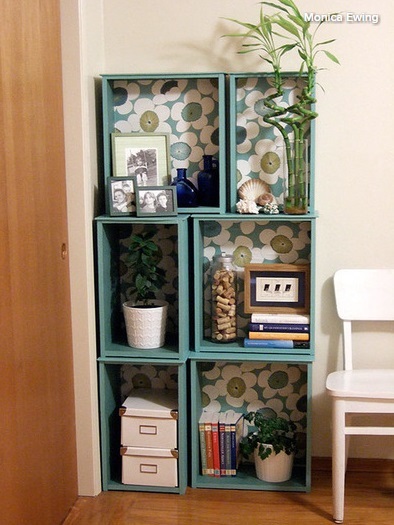 Hunt around for attractive storage to add instant practicality to your space and give it a new look at the same time. Baskets are ideal, as you can pick them up at an affordable price and they look good in most rooms. This lovely one fits nicely into the area beneath the table and makes a handy place to store scarves. Need something to rest your head on? An upcycled headboard is an ideal way to spruce up your bed. 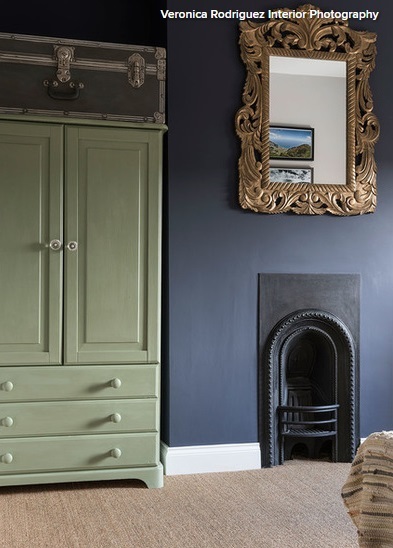 These reclaimed doors have been given a new lease of life with a lick of paint and look fabulous in this vintage-style bedroom. Look out for old builders’ pallets, which can be made into a headboard, or use some pretty fabric to cover a piece of wood. There are plenty of online tutorials to give you ideas and inspiration. Add some pattern to your sleep space without redecorating the whole room by creating a feature wall. 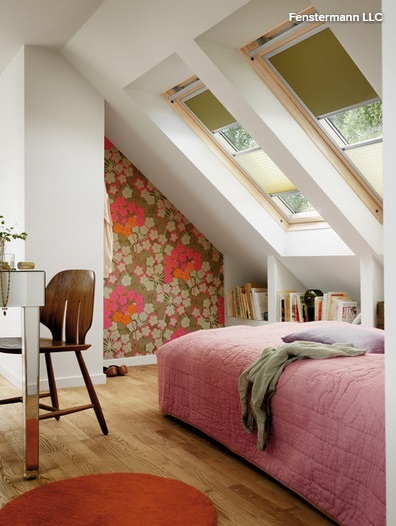 This angled nook looks stunning with some bright floral wallpaper. It’s bold enough to change the look of the whole room, even though it’s a relatively small area. 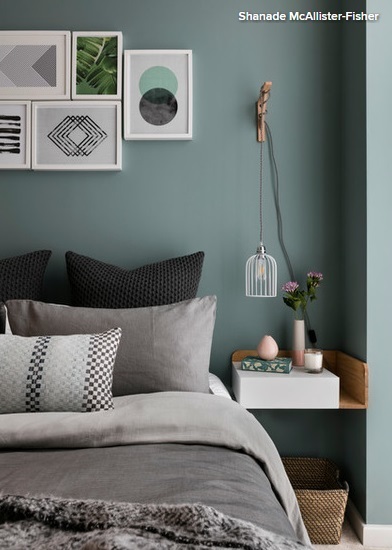 To tie the wall in with the rest of the space, pick out some key colours and use the same shades in your bed linen or accessories. Create an extra surface in your bedroom by popping a small table or ottoman at the foot of the bed. You can pick up a simple bench like this one at a low price. By tucking it into the space at the end of the bed, you’ll change the look of the room and provide handy storage as well as a place to perch. Fashion yourself an interesting storage system with a selection of box shelves. Paint them in your chosen colour, line the backs with wallpaper and arrange them how you like. This turquoise collection has been put together in a slightly off-centre arrangement for a quirky feel. A purse-friendly way to get a new wardrobe is to hunt in junk shops for a pine one. A pine wardrobe is fairly solid and also pretty affordable. If you’re not keen on pine’s varnished orange surface, paint it to match your room’s décor. This gorgeous closet was revamped with some Annie Sloan chalk paint.